Pork and apples are a classic French combination, many dishes featuring this mix comes from the Normandy area of France where apples feature very strongly in the cooking. This savory, a little sweet, and very filling, this pork medallions with caramelized onions and apples has a very special twist - it is diet-friendly and delicious. This easy to make dish isn't enlivened with fat and heavy cream, but with liberal doses of healthy seasonings and fiber-rich onions and apples. To get the full impact of just how tasty this dish is, use outdoor reared pork where possible. The meat has far more flavor than intensively reared and will be more tender when cooked with very little shrinkage and the pigs are happier too. Slice the pork crosswise into four medallions. 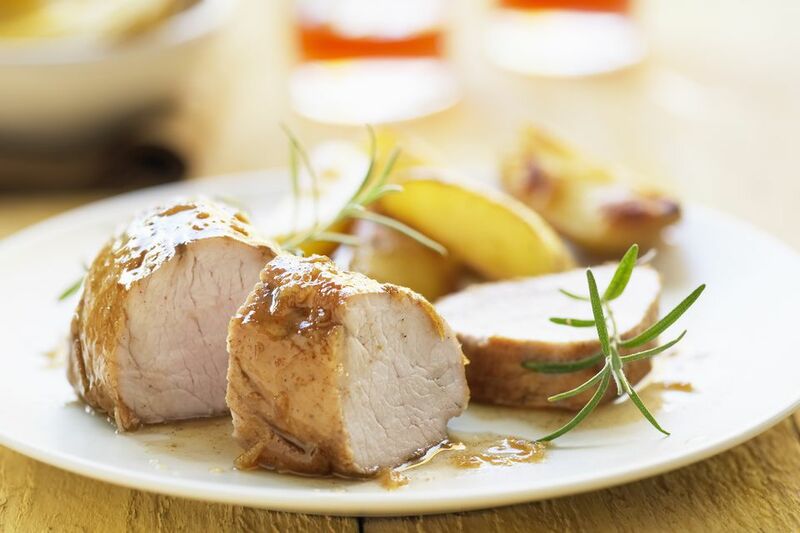 Place the pork medallions in a small glass dish and pour the apple cider vinegar over the meat. Allow the pork to marinate in the vinegar for 10 minutes, turning the meat over halfway through the marinating time. Pat the pork dry on both sides with kitchen paper and sprinkle all the surfaces with the sage, salt, and black pepper. Heat the butter and oil together in a large skillet set over high heat. Add the medallions to the pan and allow them to cook, without moving them at all, for four minutes. Carefully flip them over and allow them to cook, without moving them, for an additional four minutes. Check the pork medallions for doneness and continue cooking them for an additional one to two minutes if they appear too pink in the center. Remove the cooked pork medallions to a plate and cover them loosely with foil to keep them warm. Add the onions to the skillet and reduce the heat to medium. Cook the onions, stirring frequently, for five minutes, until they begin to brown. Add the apples and cloves to the skillet and continue cooking the mixture, stirring occasionally, for an additional five minutes until the apples have just turned tender but not falling apart. Arrange the onions and apples on serving plates. Slice the pork, if desired, or serve whole. Arrange the pork over the caramelized onions and apples and serve immediately. This pork medallions and caramelized onions and apples recipe does not keep and should be served straight away for optimum flavor.